Now that the Rangers have lost out on Zack Greinke, it seems like at the very least the Mariners will either have to wait for Josh Hamilton to figure out what he wants to do, or for the Rangers to trade for Justin Upton. They may get a shot at Nick Swisher or Cody Ross, but Swisher is from Ohio and drawing interest from the Cleveland Indians, and Ross has lost some of his luster for the Mariners since they signed Jason Bay to a one-year deal. Apart from Upton, the other three are all on the wrong side of 30, while Hamilton has shown signs of decline already, decline is likely not far off for Swisher or Ross. Any one of those guys could make sense at the right price, or the right number of years, or with the right set of circumstances. That said, there are enough teams looking to acquire one of or more than one of those guys that there remains a pretty solid chance that the Mariners will end up whiffing on all four. If that happens, they’ll need a serious contingency plan. Davis posted a 110 wRC+ last year, pretty low for a guy that hit 32 homeruns. He’s been a better hitter in the past, and has found himself in the doghouse a bit after not refining some of his contact issues. He’ll be 26 next year, and the Mets have said that they aren’t interested in trading him. He’s got four more years of team control. The Mets figure to be in the market for prospects and relief pitchers. Morrison is one of the few survivors of the Marlins firesale from this offseason. Morrison has 1146 MLB plate appearances, and a 112 career wRC+, fueled largely by extra base hits and walks. 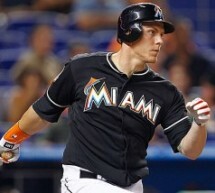 Morrison has been a bit of an attitude issue for the Marlins, who have also struggled to find him playing time at times. Morrison isn’t a great outfielder, but a capable first baseman with four years of team control left. Morneau has been pretty mediocre since suffering a concussion in 2010. That year, in only 81 games, Morneau accumulated 5.1 WAR, the most of any season in his career. In 2011 he was worse than an average player, and last year Morneau only posted a 108 wRC+. Morneau is due $14 million, and the Twins would presumably have to pay part of Morneau’s salary, but the Mariners may get a cheap look at a British Columbia native that used to be really good. Sound familiar? Viciedo is pretty similar to many young Cuban hitters, in that he swings at a lot of pitches outside the strike zone (39.9 percent compared to 30.8 percent average) and punishes mistakes (.188 ISO last year). He doesn’t walk, and his lack of zone recognition could lead to opposing pitchers simply not throwing him pitches to hit (41.2 percent of his pitches are thrown in the zone compared to 44.9 average). Viciedo is far from a finished product, but for a lump of clay he’s got pretty good potential, and entering his age 24 season, Viciedo is under team control for five more years. For years scouts and baseball analysts have been touting Brown as one of baseball’s top prospects. Since then, and three disappointing attempts at the big leagues, though limited, have sanded the shine off of Brown. He’s still got a solid track record in AAA, and will be 25 years old for most of next year. Brown, like Viciedo, would require some improvement to be productive, but he’s got star potential and may have a reduced price tag at this point in his career. Which alternative makes the most sense for the Mariners? I like Ike, or at least the Davis one. (I would have voted for Adlai Stevenson instead of Eisenhower if I’d been a couple of years older.) The rest are not attractive to me. I would like one year of Morse but not a bit of Justin Upton who is a product of the warm Arizona air. Andre Ethier, Curtis Granderson or Alfonso Soriano might be a possibilities.